Cellphone video caught a white car that apparently crashed into a strip mall before there was an explosion and damaging fire. SANTA CLARA, Calif. (KGO) -- Five businesses were completely destroyed by fire early Wednesday evening after a car crashed into the Poinciana Plaza strip mall, hitting a gas meter. Santa Clara police say they are looking for a hit-and-run driver, possibly female, and the car responsible. Video taken by a witness may have caught the driver on camera. The car looks like a white two-door Honda Accord. Video sent to ABC7 News via Instagram shows the fire moments after a car crashed into the slide of the strip mall. It then shows a woman running near a white car, dangerously close to the flames. Seconds later, the car leaves the parking lot and drives away. Fire engulfed the small strip mall and took five long-time businesses with it. PG&E capped the ruptured gas meter sometime late Wednesday night. The Poinciana Lounge, KP Liquors, ABC Laundromat, Star Hair & Nails and the restaurant Sabor Salvadoreno at the strip mall have all been destroyed by the fire. Carlos Ramirez was inside the landromat. He told ABC7 News, "I was washing my clothes, but I heard somebody say 'fire.'" A family narrowly escaped the Salvadorian restaurant they've owned for 15 years. They managed to take the cash register with them, but everything else is gone. "It's horrible. It's depressing. It's a lot of years of hard work," fire victim Debbie Hidalgo said. Lawrence Expressway near Poinciana Drive was closed for hours in both directions between Reed and Poinciana while fire crews worked to put out the fire. A person, who was not a firefighter, was transported to the hospital for possible smoke inhalation. A firefighter was taken to the hospital for dehydration and later released. Santa Clara police are asking anyone with information about the hit-and-run to call them. 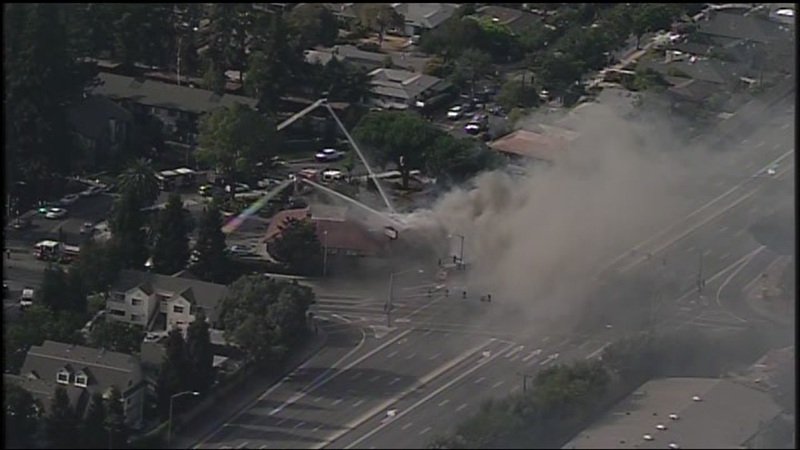 Sky 7 HD flies over the Santa Clara strip mall where an explosion happened early Wednesday evening. 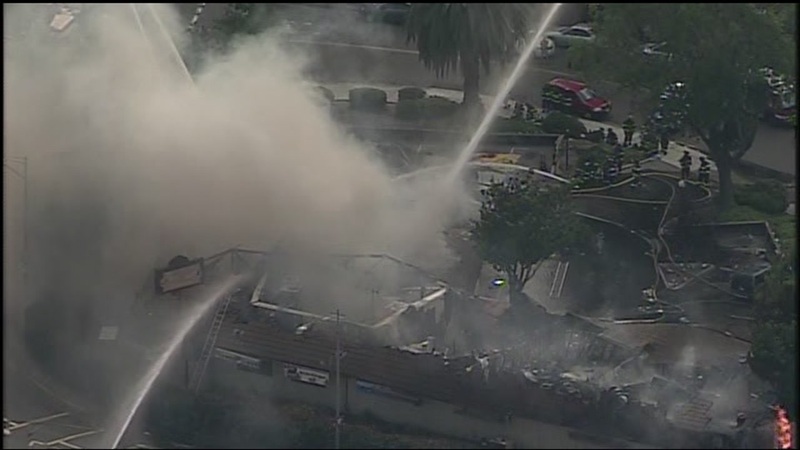 Sky 7 HD flew over a strip mall in Santa Clara that was destroyed by an explosion and fire that happened early Wednesday evening.